Whatever the sensitivity of a horse, his response to the rider’s aids is primarily linked to his training as well as his understanding of the request. Michel gives us a smooth technic to obtain a horse responsive to the leg aid no matter the horse. A good position is not only nice to watch but is also suitable to connect the motion of the horse and rider together. That said, no rider has the perfect position and everyone must deal with their own physical limitation. 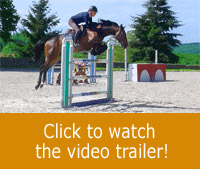 The lateral-work aims to improve the horse’s suppleness and balance. The rider will have to dissociate his aids and not work in a symmetric manner anymore. Especially to work with what is called: the active leg. The horse’s reactions as I approach him or her provide me with precious information about the way I will ride him or her. Knowing whether patting calms him, or on the contrary causes mistrusting reactions, already informs me about how he will react to messages sent by my aids. Leg pressure must, under no circumstance, be continuous. I believe that the best leg action is the one obtaining the maximum effect, using the minimum pressure. A rider who uses his eyes correctly can make progress very quickly indeed. 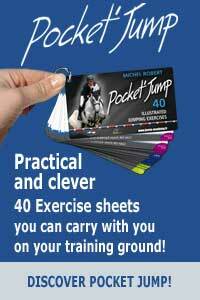 The beginners I train over jumps make considerable progress by simply being aware of where they are looking.